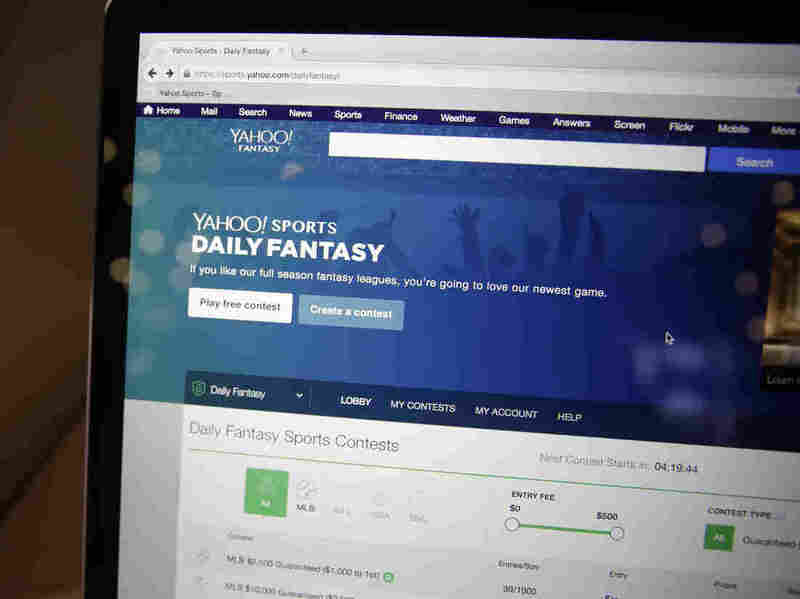 Yahoo Reveals Massive Data Breach; Internet Fixates On Fantasy Football : All Tech Considered Yahoo says 500 million user accounts may have been breached. Social media erupt in jokes. Yahoo has revealed that it suffered a massive cyber breach in late 2014, which the company believes resulted in theft of information about the accounts of at least 500 million users. The Internet responded in stride — as it has to all recent Yahoo-related news — with the regular tide of jokes about Yahoo's dinosaur status. But the reactions, spreading fast through Twitter, also revealed which Yahoo asset is most valuable to this social media demographic: fantasy sports. OK, here are some facts. Yahoo is an Internet giant, with more than 1 billion monthly active users. It sprawls through a variety of services, including blogging site Tumblr, photo site Flickr and a series of themed sites like Yahoo Finance and Yahoo Sports, which includes fantasy sports. For the uninitiated, it's the wildly popular digital expression of fandom — and a multibillion-dollar industry — where people draft virtual teams of actual players and compete based on the players' success in real games. Yahoo is one of several places to play fantasy sports, and its offerings include football, baseball, basketball, hockey, car racing and golf. Hopefully whoever hacked into my Yahoo account had better luck with my fantasy football team than I did. Of course, this is all fun and games — perhaps a reflection of the growing familiarity of this plot, a constant presence of hacks in the news. But this breach is one of the largest we've seen revealed, and it is of a service that for many users may interlink with their entire digital presence. Yahoo says a "state-sponsored actor" — as in, a foreign government hacker — got into Yahoo's network and stole information that "may have included names, email addresses, telephone numbers, dates of birth, hashed passwords." All this took place in late 2014. Yahoo says it is notifying all the affected users and taking other steps to beef up security to block any authorized access to any accounts. But also: "We are recommending that all users who haven't changed their passwords since 2014 do so." Even if there was good timing to reveal a big hack, for Yahoo this wouldn't be it. The Internet company is on the verge of closing a $4.8 billion merger with Verizon. The telecom giant says it "will evaluate" the ongoing investigation and currently has "limited information and understanding of the impact" as Yahoo only informed Verizon of the security incident "within the last two days."